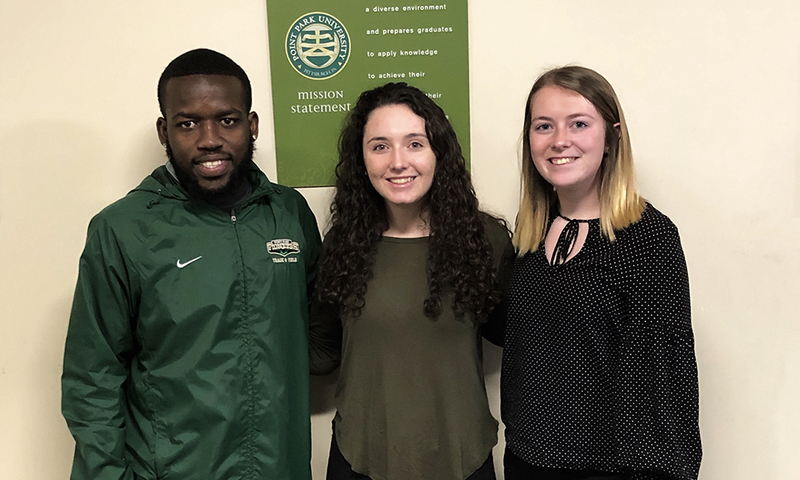 Andre Bennett, Jenna Herman and Madeline King — senior accounting majors and Student Accounting Association officers — completed an ethical leadership training certification program led by the National Association of State Boards of Accountancy Center For The Public Trust. Point Park University’s United Student Government sponsored the program course for the students. “This certification program greatly enhances both the students’ ethical leadership skills and resumes,” said Cheryl Clark, MBA, CPA, professor of accounting. According to NASBA, the ethical leadership certification course teaches college students to identify ethical issues, learn how to respond to ethical dilemmas and enhance their ethical decision-making abilities. Additionally, it helps students build their resumes and communicate their values to future employers. “The most beneficial aspect of taking this ethics course was the great wealth of information we gained on ethical ‘grey areas” and what to do when there seems to be a thin line between right and wrong,” explained Bennett, vice president of SAA and an international student from Cornell College High School in Montego Bay, Jamaica. According to King, SAA treasurer and a graduate of South Allegheny High School in McKeesport, Pa., the course made her realize how much there is to learn about ethics in the workplace across all career fields. “Before completing this course, I assumed that ethics would come naturally and that I would just know how to act ethically in the workplace. However, I learned there is a lot that goes into being an ethical leader. The course also did a great job of familiarizing me with new terms and concepts through videos, lectures and exams,” King said. Bennett, Herman and King recently worked with USG to receive funding for six additional SAA members to complete the ethical leadership certification course. “We believe this course is really beneficial to students and will provide them with the skills they need to become ethical leaders,” Herman said.